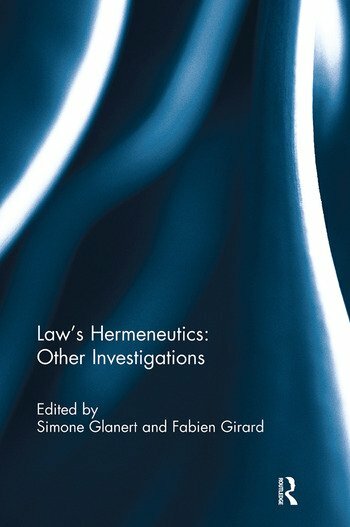 Bringing together leading academics hailing from different cultural and scholarly horizons, this book revisits legal hermeneutics by making particular reference to philosophy, sociology and linguistics. On the assumption that theory has much to teach law, that theory motivates and enables, the writings of such intellectuals as Martin Heidegger, Hans-Georg Gadamer, Jacques Derrida, Paul Ricœur, Giorgio Agamben, Jürgen Habermas, Ronald Dworkin and Ludwig Wittgenstein receive special consideration. As it explores the matter of reading the law and as it inquires into the emergence of meaning within the dynamic between reader and text against the background of the reader’s worldly finiteness, this collection of essays wishes to contribute to an improved appreciation of the merits and limits of law’s hermeneutics which, it argues, is emphatically not to be reduced to a simple tool for textual exegesis. Simone Glanert is Senior Lecturer at Kent Law School and Director of the Kent Centre for European and Comparative Law. Fabien Girard is Assistant Professor (Maître de conférences) at the Faculty of Law, Université Grenoble Alpes.